Please note that this page has three important sections: The first section addresses the riders and tells them what they need to know about the new MDA Participating Shows Program for Year End Awards. The second section is directed to the Show Managers, informing them of how to become a host of an MDA Participating Show. The third section lists the Schooling Show operators who have elected to enroll and participate in this MDA program. For Schooling shows to count toward Year End Awards, they, the shows, must now be a "Participating Member of the Schooling Show Year End Award Program". When a MDA member rides in these "Participating Member Schooling Shows" the MDA automatically tracks them for Year End Schooling Show Awards. Schooling Show riders no longer have to submit Rider Report Forms. It has been asked, "Is the MDA still giving out Awards for Recognized Shows?" YES, MDA is still granting awards for Recognized Shows! ​For more information, please refer to your newest 2018 MDA Directory, Redbook. You may also contact the Awards Chair, Beth Schaub at her new email beschaub.701@gmail.com or call 989-277-9963. She will be more than happy to answers your questions, and listen to your concerns. 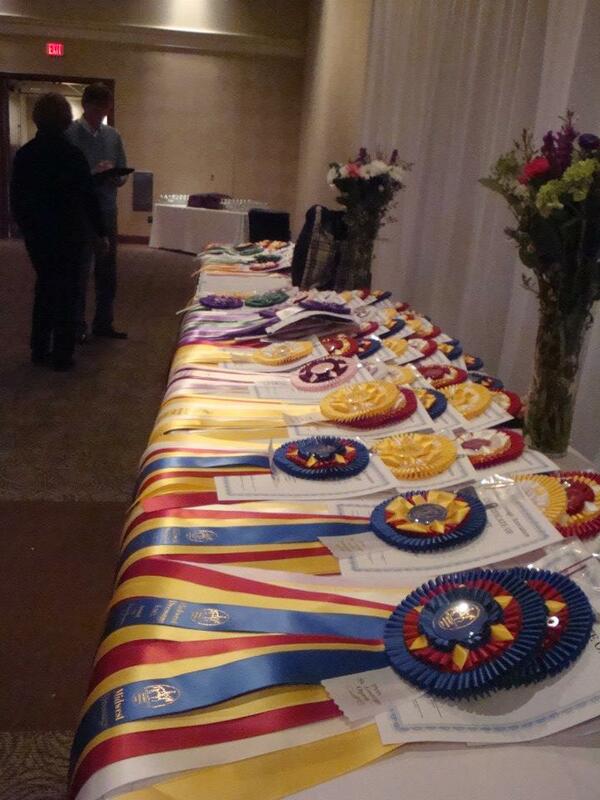 ​In 2018 Midwest Dressage Association is beginning a new program of participation for Year End Awards. Beginning this year in 2018, MDA will only be accepting scores from participating shows for Year End awards. The information below provides step by step information on how you can have your show listed as a participating MDA show! The advantage of participating in this program is that your shows receive promotion by MDA. Your shows are listed on our calendar of events and are IDENTIFIED AS MDA YEAR END AWARD ELIGIBLE. (MDA Participating Show) This distinction helps distinguish your show from non-participating shows, and is therefore more attractive to our MDA members who are working towards their Year End Schooling Show Awards. The MDA calendar is updated monthly and published both on our website and in our monthly electronic newsletter. Offer all divisions, Open, AA, Jr/Yg Rider, Novice Horse, and Novice Rider in levels as listed in the current Red Book. Note: Riders showing the same test may ride together, BUT must be placed separately. Offer Test 3 in all levels especially Introductory, Novice Horse, and Novice Rider. If possible, shift the classes that a judge will be judging to different levels from day 1 to day 2. For shows scheduled to be held April 1 through Oct. 30, payment is due on January 1 of that show year. For shows scheduled to be held November 1 through March 30 of the following year, payment is due on March 1 of that show year. Upon receiving payment and verification of the criteria to be met, the show will be added to the MDA calendar as "Participating in the MDA Year End Awards Program". 45-60 days before the show submit a proof of insurance rider to Awards Chair that shows MDA is listed as covered. Add a line to your entry form for MDA members to put their membership numbers. All riders, members and non-members, and breeds must still be welcome. Place a reminder on your entry form "If you are participating in the Midwest Dressage Association Year End awards, the names horse and riders used on entry forms must remain consistent through a show season". Have each test labeled with show name, date, judge's name and signature, test ridden, percentage and division and MDA membership number. Please see sample on page 2. Please carry the percentage out 3 places to the right of the decimal, for example 78.027. Send show results of only MDA members to the Awards Chair within 10 days after the show ends. The results for each of the shows may be in whatever form is easiest for you. Your show will be listed in the calendar section of the MDA Website and in the monthly electronic Newsletter. Your show WILL BE IDENTIFIED AS AN 'MDA PARTICIPATING SHOW', thereby making it more attractive to our membership to attend your show versus a non-participating show! This is valuable free advertising of your event. The Awards Chair will track MDA member riders throughout the show season. Show results will also to be placed in the online newsletter.